Ferdinand Magellan was a Portuguese explorer who organized the first circumnavigation of the world, starting and ending in Spain. A fleet of five ships, including the Trinidad, set out to the West in 1519 to find a trade route that could reach the Maluku Islands (also known as the Spice Islands) without entering Portuguese waters. The voyage was plagued with problems, including malnutrition, mutinies, and scurvy, which culminated in the death of Magellan during a battle in the Philippines. The expedition was then continued by his first mate, Juan Sebastian Del Cano, who brought the Trinidad and a handful of crewmembers back to Spain. In Mario's Time Machine, he meets a time traveling Mario, who travels to the Trinidad to return the Astrolabe that was stolen from Ferdinand by a time traveling Bowser. 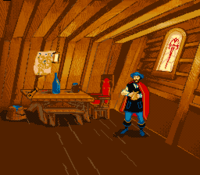 Ferdinand Magellan in the SNES release of Mario's Time Machine. In the SNES and PC versions of Mario's Time Machine, Ferdinand Magellan was captaining the Trinidad when, at some point, Bowser travels back in time to steal his Astrolabe. Mario later takes the Astrolabe back and travels back in time to 1521 so that he can return it. However, as he does not know that the Astrolabe belongs to Ferdinand, Mario questions the Trinidad's other crewmembers before he finally confirms the identity of the Astrolabe's owner. Attempting to talk to Ferdinand beforehand only has him worry about his missing Astrolabe (at this point, it cannot be returned). 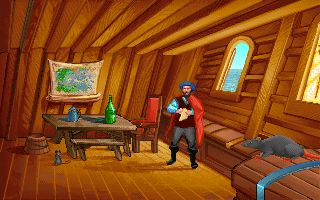 Once it is returned, Ferdinand greatly thanks Mario, and gets to continuing his route to the Spice Islands. Mario then says that he was able to set Magellan straight, which gives Ferdinand the idea to name the passage of water that he just crossed the Strait of Magellan (even though, by all accounts, he named the strait the "Estreito de Todos los Santos" after crossing through it). In the NES version, Bowser instead steals his ship's steering wheel from 1520. Magellan can be found simply walking around on his ship; if he touches an enemy, he will fall offscreen like the other NPCs, but will respawn. His ship has Bill Blasters on it. This page was last edited on January 28, 2019, at 02:49.